Visit Joey Chiu's Greenspring Inn and find out why we keep appearing in Baltimore Magazine as "Baltimore's Best." Outstanding reviews, fabulous dishes and an inviting atmosphere are what keep our customers coming back. Our newly redecorated dining room and bar surrounded by a beautifully landscaped setting complete with a stream provides a terrific setting for a business lunch meeting, a formal dinner out, or a place to hold your next party or function. 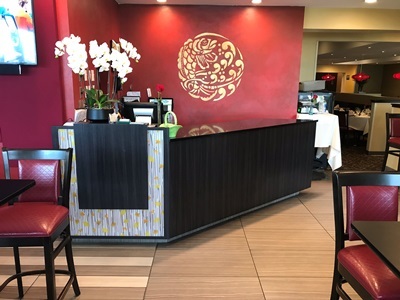 Joey’s has a complete lunch and dinner carry-out menu available so you can enjoy all your favorites in your home or office including fresh sushi. Joey Chiu’s Chinese Restaurant uses only the freshest and highest quality ingredients. The shrimp used in their shrimp dishes is one of the largest and highest quality available in the country and only Jumbo Lump crabmeat is used. The Chef prepares each dish with tremendous portions and serves it with such a presentation that it looks almost too good to eat. If it is Sushi that you crave, you have come to the right place. Our Sushi Chef creates masterpieces and serves tremendous portions. Joey Chius also has a fully stocked bar and plenty of room and menu selections to accommodate office parties, birthday parties and any other special event that comes up. Our dinner party menu is $30 per person (including tax and gratuity) and includes choice of 2 appetizers, Entrees (served family style) from each of the following categories: 1. Chicken 2. Beef 3. Shrimp 4. Vegetables 5. Fried Rice 6. Noodles and beverages (Tea, Coffee, Ice Tea and Soda). For more detail, please call us at 410-823-1125. Joey Chiu's has a traditional American buffet available for Sunday brunch and a special holiday event brunch for all major holidays such as Easter, Mother's Day & Fathers Day. Joey Chiu's also has Special Event Buffet on Thanksgiving as well as a fantastic New Years Eve Party including Buffet / Dancing and Music. Come Experience Baltimore's Best Brunch every Sunday! From 695 (Baltimore Beltway) take exit 23B Falls Road. At 2nd traffic ight (Station Drive), make right turn. Then turn left into Joey Chiu's parking lot.